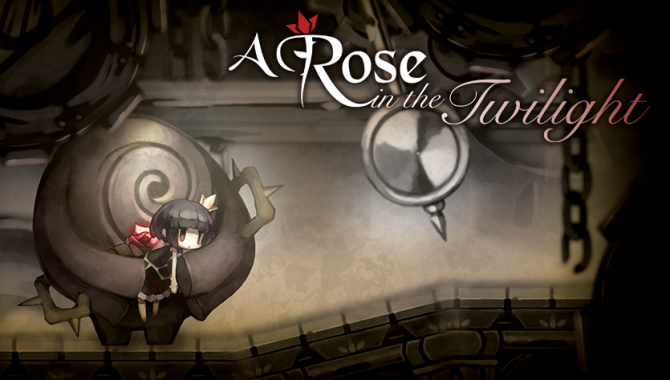 A Rose in the Twilight's protagonist is accompanied by a giant in this dark and brutal puzzle-platforming title about self-rediscovery. 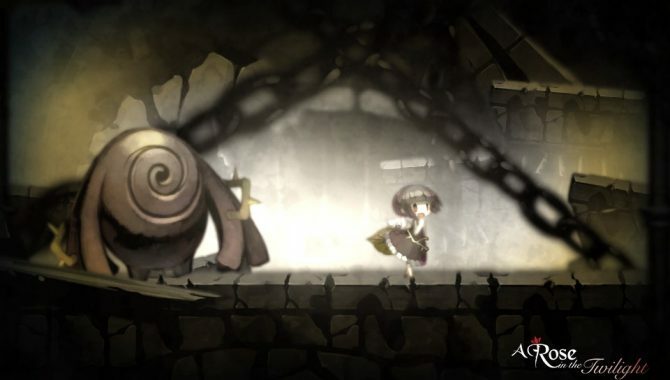 Based on its cute female protagonist with a magical affliction, familiar gameplay, and frequently dark tone, A Rose in the Twilight may appear in many ways to be creator Furuya-san’s spiritual successor to htoL#NiQ The Firefly Diary. That’s because in a lot of ways it is, albeit without the vast majority of the latter title’s maddening mechanical issues and questionable development choices. Frankly, to judge the two games together would be unfair, in short because A Rose in the Twilight is a good game. 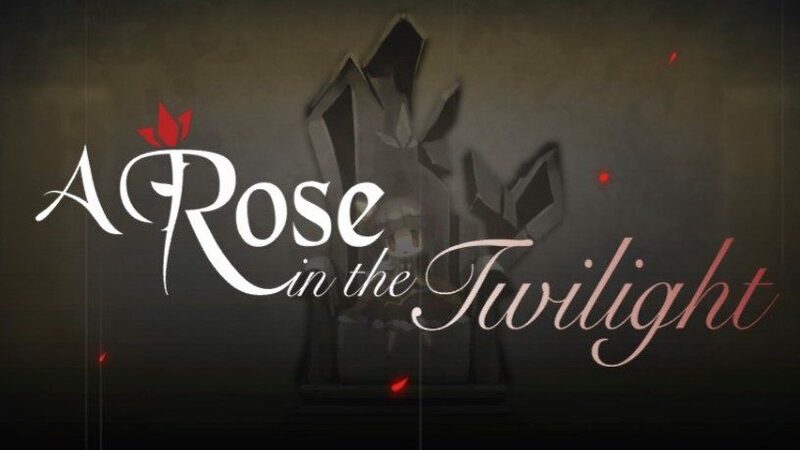 In A Rose in the Twilight, you play as Rose, a young princess who awakens in an ancient and decrepit castle alongside a stone giant, whose name appears to be Giant. Rose has been stricken with a Curse of Thorns growing out of her back. This curse creates the primary gameplay mechanic, allowing Rose to remove and grant color to certain objects. This Thorn Power pauses objects in time when color is removed from them and allows Giant to rearrange them when color is poured in. 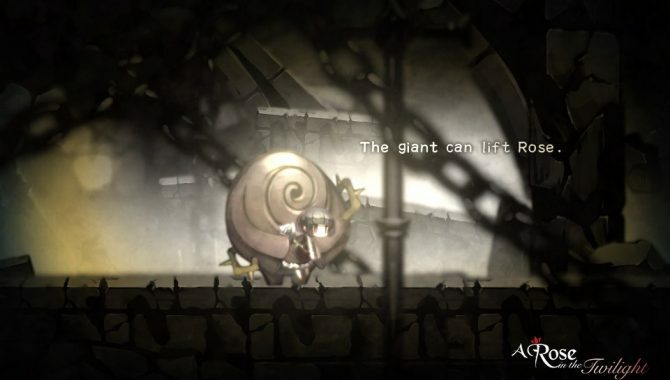 Throughout the course of the game, Rose and Giant must traverse the dangers lurking throughout the castle, whether they be enemies actively seeking violent ends to Rose’s life or simply environmental hazards (thickets of sharp thorns, blunt objects falling from the ceiling, pitfalls to game ending oblivion – typical platformer fanfair). During their journey, Rose will encounter scrolls and Blood Memories (in-game secrets) that slowly unravel who she is and why she’s here. When the game begins, Rose doesn’t exactly remember how she came to receive her curse or how she came to exist in the castle. The same goes for the seemingly gentle Giant. However, by collecting diary fragments and absorbing pools of blood (the aforementioned Blood Memories) strewn throughout the castle, Rose begins to remember the events that brought her to this point. There are a plethora of small details in this world that make it crimson with life. Hints about disreputable knights in the surrounding countryside, passages about the kingdom’s history with combating evil, and even books of poetry that help to paint the game’s central themes can all be found with a discerning eye. This is of course doesn’t even account for the sharply captivating revelations regarding Rose and Giant that are tucked away in the equally mysterious castle stuck in time. There’s no denying that the game’s style is dark and satisfying. Although the environment is basically inked in shades of grey, it never feels tired. That stark palette creates spectacular opportunities to draw the player’s attention to points of interest and to sometimes deepen the emotional impact of a particular scene, especially with a splash of red. 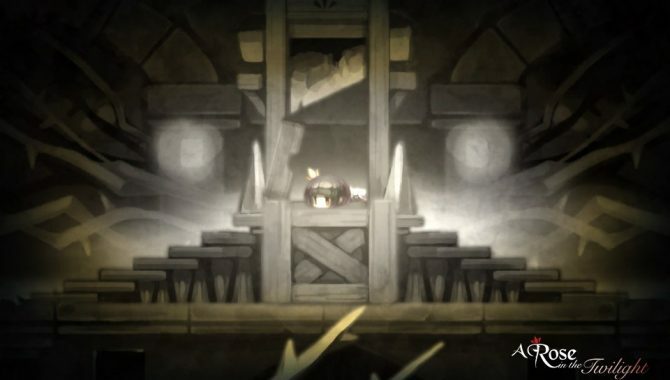 It cannot go without saying that developer NISA has no qualms about killing a small girl in increasingly horrific ways. Rose is quite fragile and as a result dies often. If she falls to a lower ledge, she will collapse in a heap, but if she falls too far (even just a little), blood will scatter across the floor. If Rose finds herself in front of an approaching enemy, she can easily be overwhelmed and crushed. One element of Rose’s curse is that she is basically immortal. Although she may perish in the most definitive way possible, she will soon be reborn. In this way, NISA has accounted for gameplay mechanics such as death and its checkpoint systems as worldbuilding opportunities. 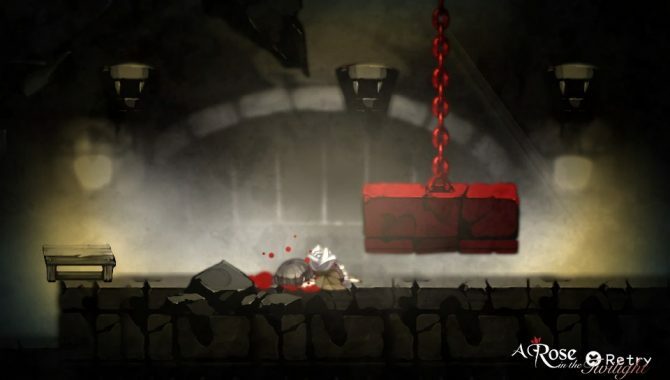 Additionally, portions of the game require Rose to interact with the environment by offering herself as a blood sacrifice. Sometimes, she must kill herself in order to unlock a new section of the castle. At first, I was a little disturbed by how irreverently I was asked to commit this young girl to acts of violent suicide. However, after subsequent sacrifices, I had the opportunity to pay closer attention to Rose’s reactions. Although a willing participant, her active emotional response to it helped me to empathize with her situation. I soon found A Rose in the Twilight‘s almost unapologetic brutality was able to fuel my emotional connection to the protagonist. After these short few execution chambers, the weight of Rose simply falling to the floor was enough to still my breathing for her well-being. To the game’s credit, it never seems to revel in violence. Although my response may not be demonstrative of how everyone feels regarding some of the game’s more questionable subject matter, it’s worth noting that I never felt disgusted by watching Rose die. In fact, in the most gruesome deaths (namely the execution chambers), the actual violence is mostly hidden and you’re given the suggestion that harm has come to her. The rest of the style choices also match the plot’s dark tone, whether it be the music/sound effects (or sometimes purposeful lack thereof) or artistic design decisions. Nothing about it suggests that the player should take joy in Rose’s misery, and rightfully so. One of A Rose in the Twilight’s primary aims is to tell a story, and it is mostly successful at that, if a little obtuse towards the end. Admittedly, I found myself scratching my head at the ending, but I suspect there’s a little more to it that subsequent playthroughs (and collecting all Blood Memories) will clarify. Nonetheless, there’s plenty to appreciate in both gameplay, plot, and character development. The game excels at making Rose and Giant feel balanced and necessary. While I never got the impression that a puzzle could be solved without both parties carrying their weight (or just Giant carrying Rose adorably), it could have been easy to put two drastically different characters together simply for gameplay convenience. Instead, NISA chose to write backstories for each, then to explore how certain revelations would affect their partnership. In this way, their relationship is one of absolute dependence but also of unexpected harmony. As for its core gameplay, A Rose in the Twilight definitely is an improvement over its predecessor. Puzzles often require some thought and obstacles ask for careful planning, but the game’s checkpoint system never feels unfair. Although you may attempt a certain room’s trial nearly ten times before you get it just right, it doesn’t feel insurmountable. As should be expected from a puzzle-platformer, certain stages are challenging, but in failure I ultimately found fault with myself and learned how to improve on the next attempt. Unfortunately, some puzzles also verged on too simple at times. Although not infuriating like titles that ask too much from the player, it was slightly disappointing. The gameplay can also sometimes leave a little too much to self-discovery. For example, the first time I needed to interact with an object, it was unclear what button on the Vita would do the trick, leading me to believe that there was something I had missed somewhere else in the castle. 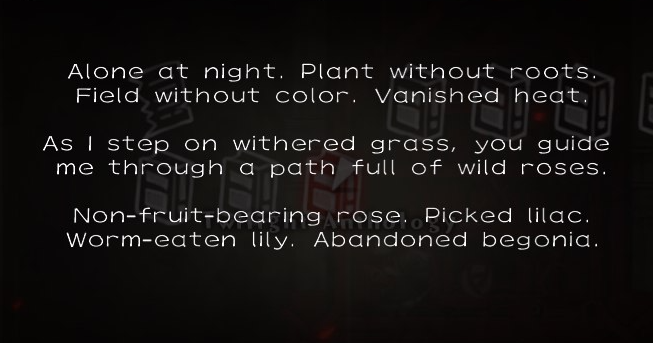 Only after wasting time retracing my steps, giving up and returning to the appropriate room to search for more clues about how to proceed, I found that O allowed Rose to interact with the object that opened the door. Fortunately, the times that the game either mistakenly or purposefully asks you to retread previously explored rooms are mitigated by being able to fast-travel to each stage via the game map. Achievement and lore hunters out there will also likely appreciate this aspect when combing the castle for secrets. The puzzle-platformer genre is one that’s difficult to master. It can be hard to please the whole crowd that’s interested in these kinds of titles, as they require both mechanical finesse and critical thinking, often simultaneously. It’s a fickle scale to balance without making something absurd. Although A Rose in the Twilight might not always please everyone’s desires for what makes a challenging game, it certainly finds some footing with success. Still, there’s no denying that A Rose in the Twilight’s story and style earn it much more praise. Rose’s past drives a tale of imprisonment that is as dark as what she must do to escape. Every memory she relives becomes a ghost that haunts her and the player alike — ultimately a much deeper, cerebral experience than other PlayStation Vita titles. Now that A Rose in the Twilight has been released on Steam and PlayStation Vita, Nippon Ichi Software America has provided a trailer detailing the most important elements of the game.